It wasn’t all one-way traffic at Donnybrook but the 68-time winners were ruthless from the first to last minute. Tom Roche goes over for one of Blackrock's seven tries. AS A CONTEST, this tie was over before it even started but Blackrock will have few complaints as they clinically dispatched King’s Hospital to surge into the next round of the Leinster Senior Schools Cup. After the disappointment of the previous two years, the 68-time winners were purposeful from the outset at Donnybrook and cleared the first hurdle of 2017 with minimal fuss. There were a host of standout performances and in bleak January conditions, we got a glimpse of what Justin Vastone’s side will bring to this year’s competition; power, pace and an entertaining brand of rugby. King’s Hospital gave as good as they got but were simply unable to compete with a bigger and far more technically astute outfit as Blackrock produced a performance brimming with intent. Flanker Alan Francis set the tempo with a fierce hit on his opposition number from the back of a scrum in the opening minute and from there, Blackrock pounced. A move involving a rampaging run from prop Joe Byrne was eventually finished off in the far corner by John Gallagher. The south Dublin school would cross the line three more times before the interval and by that stage had safely secured their passage through to Friday’s second round draw. This afternoon’s assignment was never going to cause them much trouble but having been knocked out of the running by Roscrea and Belvedere in the last two years, this result will inject some momentum into their campaign ahead of sterner tests. Even still, you couldn’t not be impressed by Blackrock. They looked to run from deep at every opportunity and even allowing for the driving rain which swept across the ground for much of the game, the handling and offloading was a joy to watch. Scrum-half Patrick Patterson and, outside him, Tom Roche were hugely influential with both getting on the scoresheet with first-half tries. The latter showed great speed to finish after Giuseppe Coyne’s deft offload in the fifth minute. Patterson was then the creator shortly after as he scythed through midfield — once again displaying sheer pace and power — before the ball was recycled out wide for Roche to go over. King’s Hospital, to their credit, showed attacking intent too but were met by a brick wall every time they got ball in hand as Blackrock were up fast to make some crunching hits. Edward Mahood’s well-struck penalty got the Palmerstown school on the board in the 21st minute and after Andrew Murphy had added Blackrock’s fourth, King’s Hospital came out for the second half fighting. With Blackrock giving their bench a run-out, Matt Jarvis’ men were able to enjoy periods of sustained pressure with Rock’s discipline coming into question on more than one occasion. Referee James Fitzgerald awarded King’s Hospital six or seven penalties in quick succession but Blackrock showed another side to their game with some excellent defensive work to keep the door shut. It was arguably a better workout than running in scores at the other end with Blackrock forced to scramble to keep King’s Hospital at bay during a stop-start second period. They did, however, finish with a flourish after King’s Hos had been reduced to 14 men as captain Cian Reilly helped himself to two tries either side of a fine solo run from winger David Heavey. A job well done for Blackrock but certainly room for improvement as they begin their quest for title number 69. As always, a side worth keeping a close eye on over the coming weeks. Tries: John Gallagher, Patrick Patterson, Tom Roche, Andrew Murphy, Cian Reilly , David Heavey. BLACKROCK COLLEGE: 15. John Gallagher (22. Peter O’Reilly 6′), 14. Tom Maher (23. Mark Phelan 46′) 13. Tom Roche, 12. Gavin Jones, 11. David Heavey, 10. James Moriarty, 9. Patrick Patterson (21. Richard Fahy 60′) 1. Giuseppe Coyne (17. Carl Delaney 65′), 2. Stephen McLoughlin (16. James McShane 65′) 3. Joe Byrne (18. Thomas Clarkson 46′) 4. Andrew Murphy, 5. Charlie Ryan (19. James Burke 65′), 6. John Fairley (20. Michael McGagh 43′) 7. Alan Francis, 8. Cian Reilly (captain). THE KING’S HOSPITAL: 15. Ian West, 14. Connell Howley, 13. Ross Hackett (22. Paddy O’Boy 45′), 12. Edward Mahood (19. Luke Corr 65′) 11. Clinton Wokocha (23. Luke Gilmartin 65′) 10. Fionn O’Loughlin, 9. Scott Le Roux (21. Harrison Mahood 67′); 1. Sean Goodburn (17. Andrew Irwin 67′) 2. Felix Campbell (17. Alan Bennett 67′) 3. Nathaneal Sibanda (18. Killian Smith 52′) 4. Rhys Edgehill, 5. Zac Bursey, 6. Sam Wrafter (captain), 7. Osebor Evbodaghe, 8. David Boles. Email “Blackrock lay down an early marker with seven-try win over King's Hospital”. 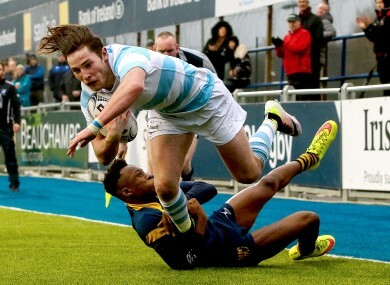 Feedback on “Blackrock lay down an early marker with seven-try win over King's Hospital”.